Once a promoter of food sovereignty for the Hawaiian Islands, Oprah Winfrey has stooped to new levels of infamy. In her best-selling, worldwide magazine, O, she is running Monsanto advertisements that promote biotech and Big Ag farming practices. Did Oprah do this accidentally due to the massive size of her empire and a lack of oversight, or is the TV talk show queen also now in the shackles of the multinational chemical sales company? She has been a vocal advocate for organic foods, and even has her own organic brand called “Oprah’s Organics,” so why now, is she supporting one of the biggest land polluters and most hated companies in the world? Many are asking where her true allegiances lie. Has she become corrupt by extreme wealth? Was this support of Monsanto an oversight? Monsanto advertisement that appeared in Oprah’s ‘O’ magazine. According to a Dec. 14 post from the Institute of Responsible Technology’s Facebook page, Oprah magazine is going to run a Monsanto ad in 2015. There are already pictures of the copy circulating on the Internet. This is definitely out of character for a woman who owns an organic farm, and has also featured articles in O previously that discuss the dangers of GMOs. 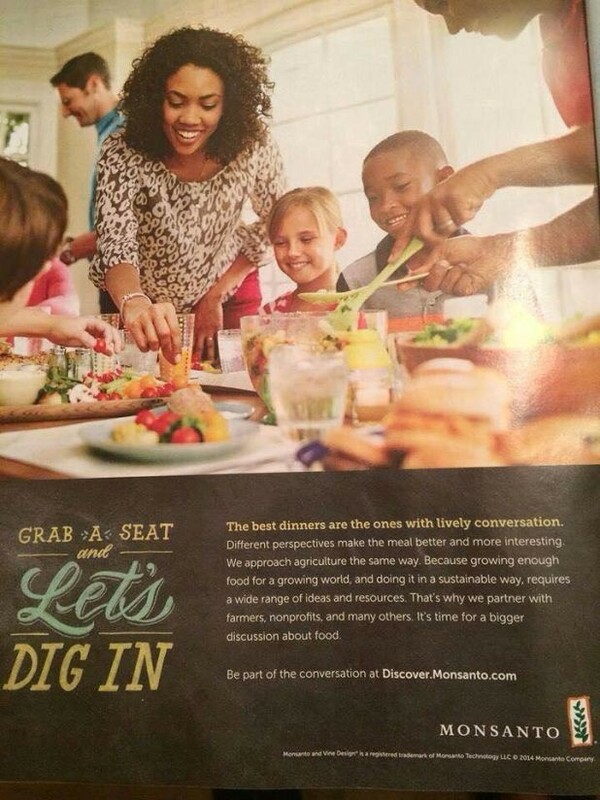 Monsanto’s new ad campaign obviously targets multi-racial families, and wants to portray eating biotech poison like it is some kind of family holiday, “because growing enough food and growing it in a sustainable way” is ever-important to them? Monsanto has bankrupted thousands of farmers and sued more than 150 of them just in the US, decimated bee and butterfly colonies, eradicated crops that have been around for thousands of years with cross-pollination, and threaten to do even more damage, if they are continuously planted unchecked. What’s even more ironic is that 7 African nations have rallied against Monsanto, and Oprah’s had a pet-project in an African Girl’s schools for years. Does she want to poison the young brains she is educating? I think most of America is hoping that this is all a big mistake. What gives Oprah?